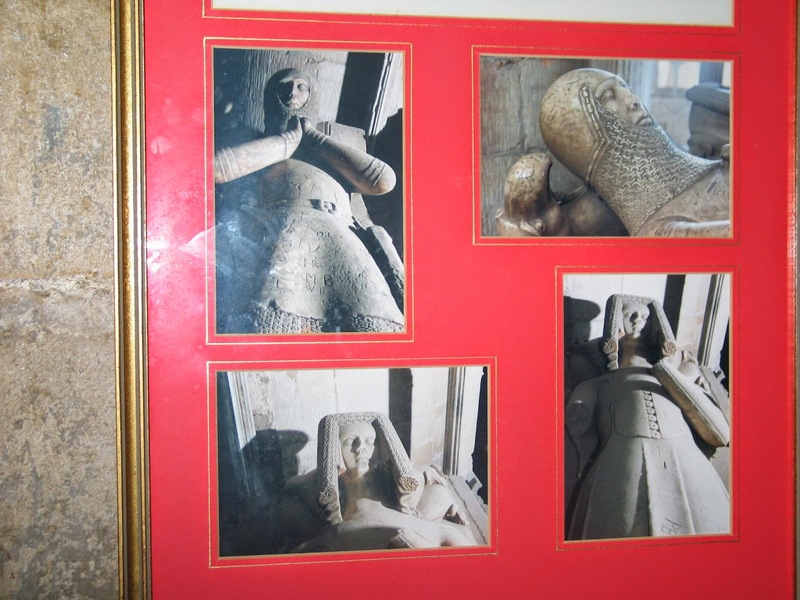 A post today about Hugh, Lord Despenser, the eldest son of Hugh Despenser the Younger and Eleanor de Clare, and grandson of Hugh Despenser the Elder, earl of Winchester. As was the case with many noble families of the Middle Ages, the Despensers were none too creative when it came to naming their children; the chancery rolls of the 1320s, when all three generations of Hugh Despensers were active, contain a few confusing references to ‘Hugh, son of Hugh le Despenser the son’. Hrrrrrm. Edward II’s last chamber journal of 1325/26 refers to Hugh by the short form Huchon, and the Anonimalle chronicle calls him Hughelyn or ‘little Hugh’, both of which I think are absolutely delightful. In this post, I’ll call him Huchon to save any confusion with his father and grandfather, and because this seems to have been how he was known by his great-uncle Edward II. I’ve also been known, along with Susan Higginbotham, to call him Hugh Despenser the Even Younger or HDEY for short. Huchon’s date of birth is unknown, but judging by the evidence of his mother’s Inquisition Post Mortem took place sometime between 1308 and 1310. He was the eldest great-grandchild of Edward I and Eleanor of Castile and the eldest great-nephew of Edward II, and was only two or three years younger than his great-aunt, Edward I’s youngest child Eleanor, who was born in May 1306 (and who died in the late summer or early autumn of 1311). Huchon’s mother was Eleanor de Clare, Edward I’s eldest granddaughter and second grandchild, born in October or November 1292 as the daughter of Gilbert ‘the Red’ de Clare, earl of Gloucester and Hertford (1243-1295) and the king’s second daughter Joan of Acre (1272-1307). Eleanor was between fifteen and seventeen when she gave birth to Huchon, depending on when exactly in 1308 or 1310 he was born, and Huchon’s father Hugh Despenser the Younger was probably about twenty or twenty-one at the time; the couple had married in May 1306, when Eleanor was thirteen and a half, in the presence of her grandfather Edward I. Huchon’s lineage was prestigious: first great-grandchild of Edward I and grandchild of Gilbert ‘the Red’, the greatest English nobleman of the day, and in 1322 his other grandfather Hugh Despenser the Elder was made earl of Winchester. On the Despenser side, Huchon was the great-grandson of both William Beauchamp, earl of Warwick (d. 1298) and of Aline Basset, countess of Norfolk (d. 1281). His uncle Gilbert de Clare, earl of Gloucester, was killed at Bannockburn in June 1314, leaving Huchon’s mother Eleanor and aunts Margaret and Elizabeth as heirs to the great de Clare inheritance. As the eldest child, Huchon was the heir of both his parents, and could look forward to receiving his mother’s third of the de Clare lands and his paternal grandfather’s Despenser lands.Huchon was born a year or two into the reign of his great-uncle Edward II (Edward I didn’t live quite long enough to see the birth of his first great-grandchild), and thus grew up in an England racked by civil war and the general turmoil of Edward’s disastrous reign. He was about five or six when the king lost the battle of Bannockburn and Huchon’s uncle, the greatest nobleman in the realm after the earl of Lancaster, was killed; possibly this was one of Huchon’s earliest and most abiding memories. Throughout his childhood and adolescence, Huchon’s mother regularly gave birth to his siblings: he had younger brothers Edward, Gilbert and John plus a baby boy who died in 1321, and younger sisters Isabella, Joan, Eleanor, Margaret and Elizabeth. His first cousins included William Donn de Burgh, earl of Ulster, and Margaret Audley, countess of Stafford. When he was about ten or so, in the late 1310s, his father Hugh became the ‘favourite’ and perhaps the lover of Huchon’s great-uncle the king; the annals of Newenham Abbey in the 1320s refer to the two men as ‘the king and his husband’, rex et maritus eius. I would give a great deal to know what that felt like for Huchon. Bizarrely, Huchon’s mother Eleanor de Clare was said by a Flemish chronicle also in the 1320s to have had an incestuous affair with her uncle Edward II and to have been imprisoned after her uncle and her husband’s downfall in 1326 in case she might be pregnant by the king, and certainly my own researchindicates that the two were remarkably close at the end of Edward’s reign. Whether or to what extent any of this is true is impossible to know for certain, but it may be that both of Huchon Despenser’s parents were Edward II’s lovers. Can’t have been boring to be a Despenser child, that’s all I can say.One of the earliest, or perhaps the earliest, refs to Huchon I know of comes on 21 July 1322, when he was at the beginning of his teens, and sent by his great-uncle the king to “diverse parts of the realm” (no fewer than twenty-three counties are named, as far apart as Dorset and Yorkshire) with huntsmen and dogs in order to “take fat venison of this season” in the royal forests and parks. [Patent Rolls 1321-4, p. 184;Close Rolls 1318-23, p. 577.] The nine men accompanying him are named on the Close Roll, and they had twelve greyhounds, thirty-four buck-hounds and eight harriers. This sounds like it must have been a most enjoyable escapade for the boy, travelling all over the country to hunt. Huchon appears on record again in May 1323, when Edward II signed a thirteen-year peace treaty with Robert Bruce, king of Scotland. Bruce’s associate Thomas Randolph, earl of Moray, travelled to England to negotiate the terms, and Edward sent several noblemen to Scotland as hostages, as it were, to assure Bruce of Moray’s safe return. They included Huchon, John, Lord Hastings (nephew and one of the co-heirs of Aymer de Valence, earl of Pembroke) and his three-year-old son Laurence, and the northern lords Henry Percy and Thomas Wake. [Patent Rolls 1321-4, pp. 277-8; Calendar of Documents Relating to Scotland 1307-57, p. 150.] All went well; Edward II and his advisers and Moray negotiated the treaty, Bruce ratified it a week later and sent the hostages back to England shortly afterwards, having promised to treat them honourably during their sojourn in his kingdom and to return them home in peace should the earl of Moray die a natural death while in England. Huchon is also mentioned several times in his great-uncle the king’s last chamber account of 1325/26: in December 1325 Edward II paid ten shillings for some material, including wool, linen and ‘camoka’ (a kind of silk, I think), to make clothes for him, and also bought him an aketon, which was a padded defensive jacket. Around the same time, the king’s armourer was paid for repairing the arms of Huchon le Despens’ fuitz le fuitz, ‘Huchon Despenser son of the son’ (haha). Huchon’s world fell apart in 1326/27, when Queen Isabella and Roger Mortimer invaded the realm. His great-uncle the king was deposed and imprisoned. His grandfather the earl of Winchester was executed, and mere weeks later his father Hugh Despenser the Younger also, and horribly. His mother Eleanor de Clare was imprisoned. Three of his five younger sisters were forcibly veiled as nuns, despite being mere children at the time (the two who escaped were fourteen-year-old Isabella, already married to the earl of Arundel’s son, and Elizabeth, only a baby or still in utero). Huchon himself remained at his father’s great South Wales castle of Caerphilly (built in the 1270s by Huchon’s maternal grandfather Gilbert ‘the Red’), which his father and great-uncle had left in early November 1326, leaving numerous possessions and a great deal of money behind under Huchon’s care. They were captured on 16 November, and Hugh was executed eight days later. At some point probably in November, Isabella and Roger Mortimer ordered Caerphilly to be besieged, offering free pardons on several occasions to the garrison inside and promising that their lives would be spared and their goods not forfeited if they surrendered, but pointedly excluding Huchon by name: in short, they wanted to have him executed. It is hard to discern any real reason for this beyond vindictiveness and a desire to execute the third man in England named Hugh Despenser. Huchon was only seventeen or eighteen at the end of 1326 and had committed no crime except to be the eldest son and heir of the loathed Hugh the Younger. Fortunately for the young man, the Caerphilly garrison under the command of Sir John Felton refused to give him up to execution, and held out under siege until 20 March 1327, when Isabella and Roger gave in and promised to spare Huchon’s life. The garrison thus finally surrendered, and Huchon received a “[p]ardon to Hugh son of Hugh le Despenser the younger of the forfeiture of his life, without restitution of his lands.” [Patent Rolls1327-30, p. 14.] Huchon is briefly mentioned in the Anonimallechronicle at Christmas 1326: En cel men temps Hughelyn le Despenser ficz au dist sire Hugh se tint el chastel de Kerfily, ‘At this same time Hughelyn le Despenser son of the said Sir Hugh remained at the castle of Caerphilly’. Roger Mortimer and Isabella kept their word and spared Huchon’s life, but he was imprisoned for the rest of their regime. (On what charge, I have no idea.) At first Huchon was in the custody of Roger Mortimer himself – perhaps at Wigmore or at Ludlow, I don’t know – and on 15 December 1328 was transferred to prison at Bristol Castle, where his jailer was Sir Thomas Gurney, who was convicted by parliament two years later of the murder of Edward II at Berkeley Castle in September 1327. [Close Rolls 1327-30, p. 352.] This surely can’t have been a pleasant experience for Huchon. His great-uncle Edmund of Woodstock, earl of Kent – youngest son of Edward I and only about seven or eight years older than Huchon himself – was arrested in March 1330 and convicted of treason after attempting to free the supposedly dead Edward II from captivity. Kent’s confession as recorded in the chronicle of the royal clerk Adam Murimuth names Huchon as one of his adherents: Kent stated that one Sir (or Brother) William Cliff “came unto him from Hugues le Despenser, who told him that he would be well pleased to be with him; for he said that he [Kent] would be sure of the deliverance [of Edward II] in short time.” [Adae Murimuth Continuatio Chronicarum, ed. E. M. Thompson, pp. 255-7.] William Cliff, from my own research, appears to have been the man of this name who was a clerk of both Edward II and the Despensers and whom Huchon’s father Hugh the Younger appointed as his attorney in July 1322. Whether Huchon truly believed that his great-uncle Edward II was still alive in 1330 is impossible to know, but certainly he must have been more than willing to do anything which might bring down the regime of Isabella and Roger Mortimer. Huchon was finally released from prison in or a little before September 1331, a few months after Edward III took over the governance of his own realm, and in April 1332 was granted permission to go on pilgrimage to Santiago de Compostela in Spain. [Patent Rolls 1330-4, pp. 246, 273, 277.] He was now about twenty-four or so. Life must have been strange for him in many ways: he was a close kinsman of Edward III (his mother Eleanor de Clare was the king’s much older first cousin), of high birth and related to most of the nobility of England, but was also the son and grandson of two notorious and despised traitors, whose name he bore. Edward III, not a vindictive man or one to visit the sins of the father on the son, granted him various manors throughout the 1330s in fulfillment of 200 marks of land he had promised him (see e.g. Patent Rolls 1330-4, pp. 267, 377, 462). The Despenser lands of Huchon’s grandfather were forfeit to the Crown as Hugh Despenser the Elder had been executed for treason, and remained so until restored by Richard II to Hugh the Younger’s great-grandson Thomas in 1397, but Huchon was heir to his mother Eleanor de Clare and her vast inheritance. When Eleanor died on 30 June 1337, aged forty-four, her lands passed by right to Huchon, who was then said to be twenty-six, twenty-eight or twenty-nine. [Calendar of Inquisitions Post Mortem 1336-46, pp. 78-80.] The most important part of the inheritance was the great lordship of Glamorgan in South Wales. Huchon was a knight and soldier: he fought for Edward III at Halidon Hill in 1333 and at the battle of Morlaix in 1342, where his younger brother Edward – second of the four surviving sons of Hugh the Younger and Eleanor de Clare – was killed. In 1341, Huchon received permission from Pope Benedict XII to marry Elizabeth, daughter of William Montacute, earl of Salisbury and close friend of Edward III [Calendar of Papal Letters 1305-41, p. 553]. Permission was needed as Elizabeth’s first husband Giles Badlesmere, who died in 1338, was related to Huchon in the third degree of affinity; Giles’ mother Margaret de Clare was the first cousin of Huchon’s mother Eleanor de Clare. Elizabeth’s parents William Montacute and Katherine Grandisson married in about 1327, and their eldest son William was born in 1328, so Elizabeth can hardly have been more than nine when her first husband died and twelve when she married Huchon, who was about twenty years her senior. One of Elizabeth’s sisters married Huchon’s nephew Edmund Fitzalan, son of his sister Isabella and Richard Fitzalan, earl of Arundel, and another married Roger Mortimer’s grandson Roger Mortimer, second earl of March, and was the mother of Edmund, third earl. Sadly, the marriage of Huchon and Elizabeth remained childless. Hugh ‘Huchon’, Lord Despenser, lord of Glamorgan, died on 8 February 1349 at the age of about forty, possibly of the Black Death which was then raging through England, though this is uncertain and he may have died of natural causes. [His Inquisition Post Mortem is in Calendar of Inquisitions Post Mortem 1347-52, pp. 328-342.] As he had no children, his heir when he died was his nephew Edward (1336-1375), eldest of the four sons of his second brother Edward (killed at the battle of Morlaix in 1342): “Edward son of Edward le Despenser brother of the said Hugh, aged twelve years and more, is his heir.” The younger Edward Despenser was also the heir of Huchon’s long-lived aunt Aline, Lady Burnell, when she died in 1363. Huchon’s widow Elizabeth Montacute later married her third husband Sir Guy Bryan, and had children with him, so perhaps Huchon was infertile. 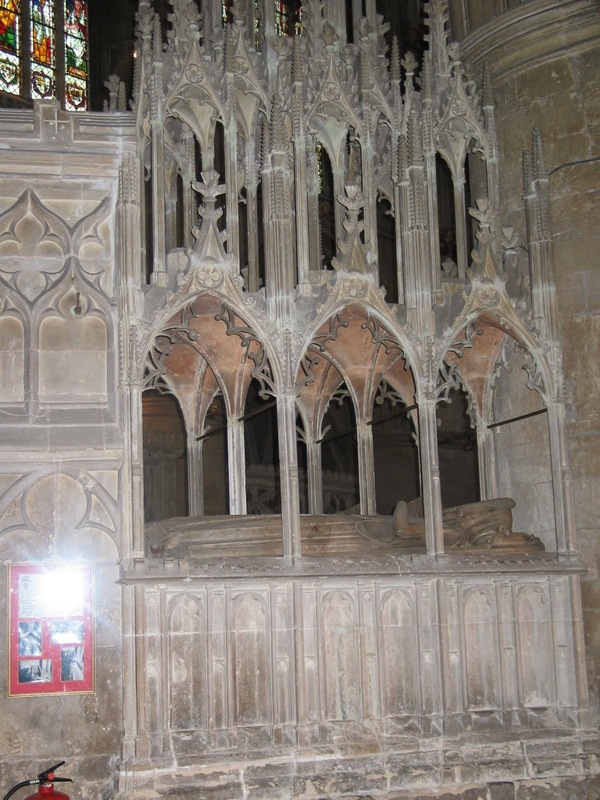 Below: the tomb of Huchon and Elizabeth Montacute can be seen to this day in Tewkesbury Abbey, Gloucestershire,which happily survived the Dissolution. Huchon’s parents, his uncle the earl of Gloucester (d. 1314), grandfather Gilbert ‘the Red’, nephew Edward (d. 1375) and great-nephew Thomas, earl of Gloucester (d. 1400) are also buried in the abbey, along with numerous other members of the de Clare and Despenser families.